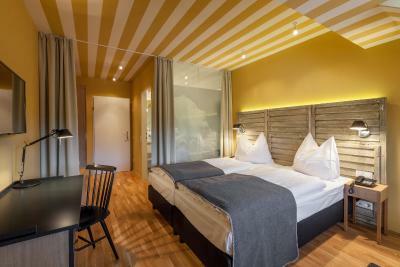 Lock in a great price for Hotel Schloss Leopoldskron – rated 8.8 by recent guests! Lovely historic hotel grounds. The breakfast in the main mansion was wonderful. Beautiful place. Free parking and close to Old a Town was a plus. Beautiful building and views. 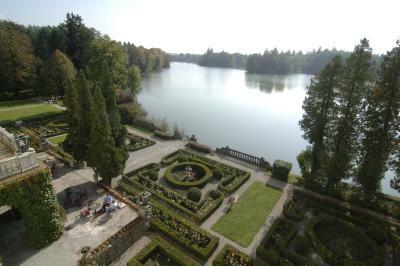 Very novel to have the von trapp view of the lake and the room the ballroom in the film was based on. Breakfast was really good and we slept very well. They have bikes free to borrow. The front desk staff was wonderful. They spoke excellent English and were always ready and willing to help with any of our questions. The morning views were breathtaking and they had a nice seating area for enjoying the view and relaxing. 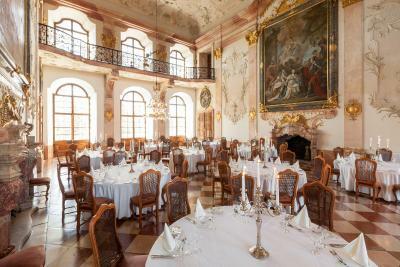 The breakfast was excellent and held in a beautiful room in the palace. It truly did not disappoint. They didn't have a restaurant on hand but there were many within a five minute walk. There is a small cafe that was open 24/7 with drinks and pastries. Staff were very warm, friendly, inviting, gracious. The amenities were superb and the palace was absolutely beautiful! 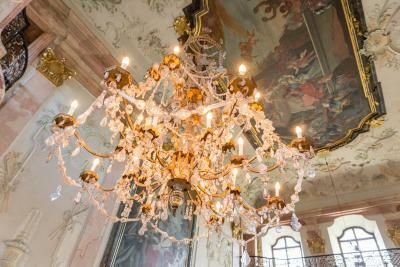 Loved the history and beauty on the Schloss. Many thoughtful touches (car brush for snow, umbrellas, water, cat...)! Being able to enjoy a fabulous breakfast in the ballroom with a Mimosa was wonderful. The breakfast buffet is to die for. Tasty prosciutto, the freshest fruits, endless coffee, delicious scrambled eggs, excellent service - and included in the price. Excellent in every way. 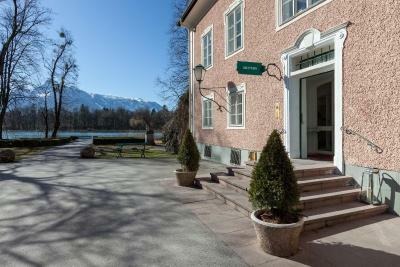 This exclusive hotel offers scenic mountain views and cozy rooms in an annex of the historic Leopoldskron Palace, just 1.2 mi from Salzburg’s historic center. Scenes from The Sound of Music were filmed on site, and the Salzburg Festival was founded there. 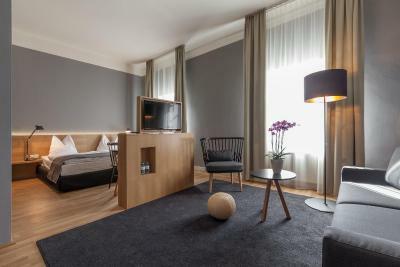 The rooms in the Meierhof Annex and the suites, which are all located at the palace, feature satellite TV, a mini-bar, and a bathroom. 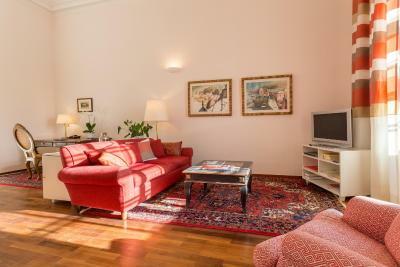 A fitness center and bikes are at guests' disposal and free WiFi is provided in all areas. Drinks and cakes are offered at the Meierhof Café which also features a terrace with views to the garden and to the Leopoldskroner Weiher Lake. Upon arrival, a welcome drink is served in one of the 3 neighboring restaurants within 5 minute walking distance. 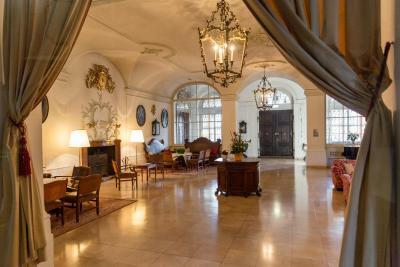 Free private parking is available at Hotel Schloss Leopoldskron. Jogging and cycling trails are right outside. Guests can enjoy free access to a public pool and miniature golf course located next to the hotel complex. 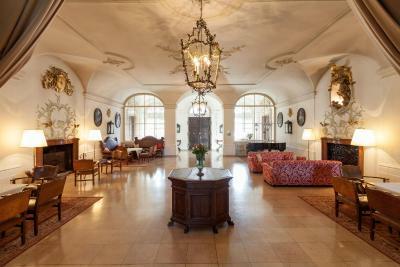 When would you like to stay at Hotel Schloss Leopoldskron? 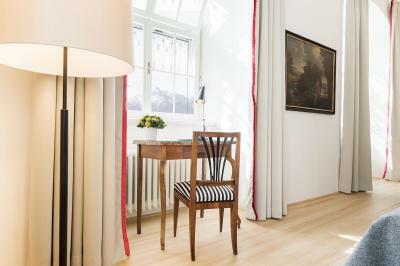 This room is located in the Meierhof annex building and features views of a quiet inner courtyard or the Hohensalzburg Castle. 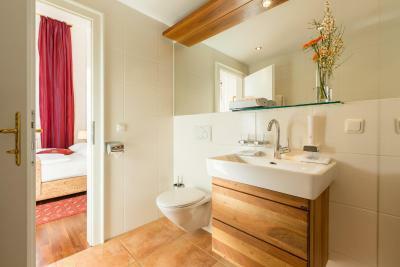 The room comes with satellite TV, a private bathroom with a hairdryer and free toiletries, and a safety deposit box. 1 bottle of mineral water is provided upon arrival. 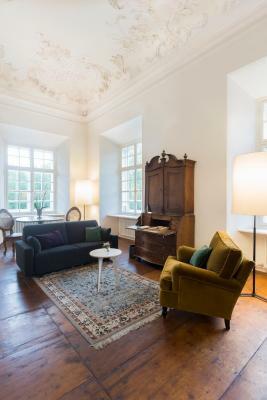 This room is located in the Meierhof annex building and features views of a quiet inner courtyard, the Leopoldskron Palace or the Hohensalzburg Castle. 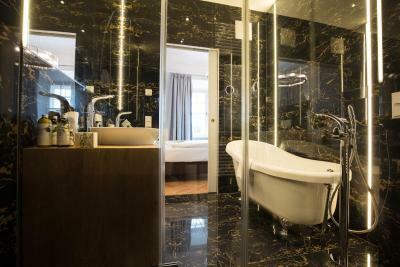 The room comes with satellite TV, a private bathroom with a hairdryer and free toiletries, and a safety deposit box. 1 bottle of mineral water is provided upon arrival. 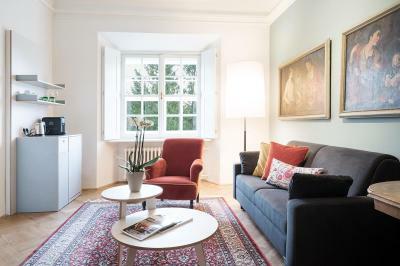 Please be aware that this room type will be completely renovated from 08.01.-06.03.2018 and the images are example illustrations. 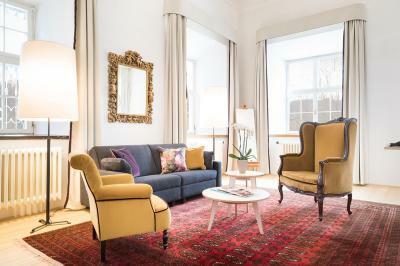 Located in the palace, all of these very spacious suites offer separated living and sleeping places and feature antique furniture, high ceilings and original parquet flooring. 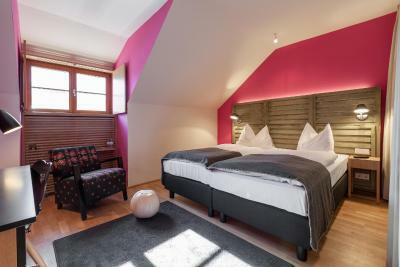 They offer views of the Leopoldskroner Weiher Lake and the Untersberg Mountain. Some suites feature a connection door to other suites and others come with a separate dressing room. 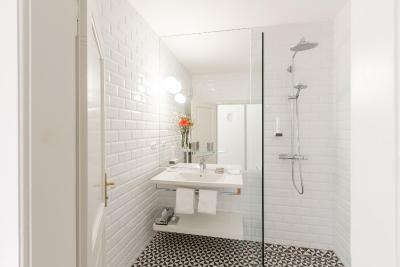 The suites come with satellite TV, a private bathroom with a bathtub or shower, a hairdryer, bathrobes and free toiletries, and a safety deposit box. 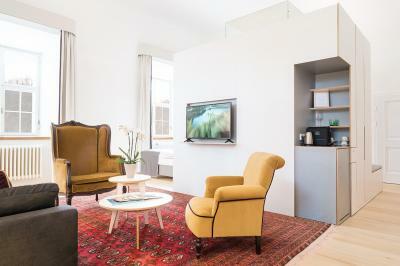 1 bottle of mineral water, sparkling wine and fresh fruits are provided upon arrival and free WiFi is available. 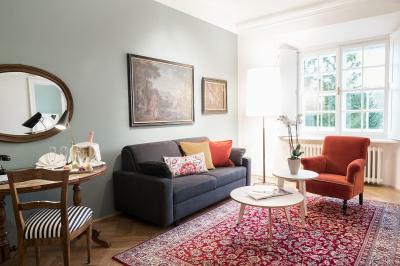 Located in the palace, most of these suites offer separated living and sleeping places and feature antique furniture, high ceilings and original parquet flooring. 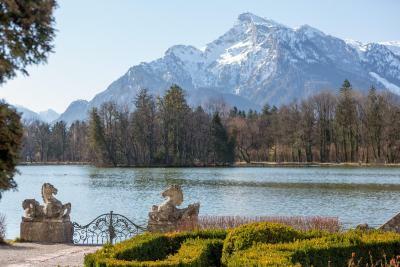 They offer views of the park or Hohensalzburg Castle. Some suites feature a connection door to other suites. 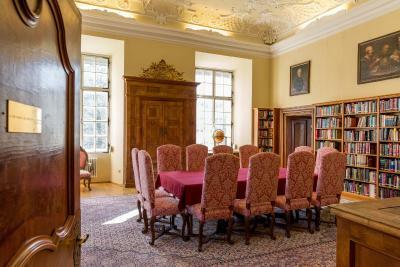 This room is located in the Meierhof annex building. 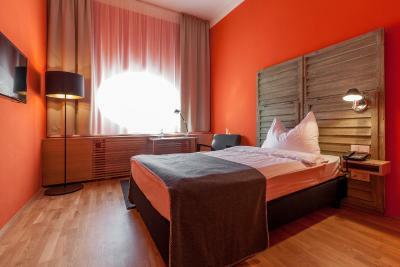 The room comes with satellite TV, a private bathroom with a shower or a bathtub, a hairdryer and free toiletries, and a safety deposit box. 1 bottle of mineral water is provided upon arrival and this room also has a sofa. 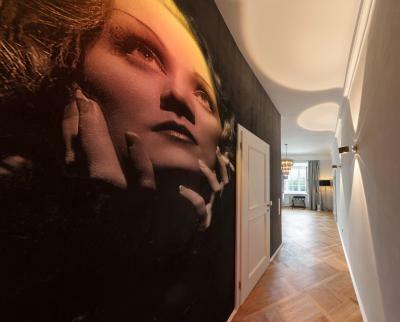 Some rooms are Sound of Music-inspired. 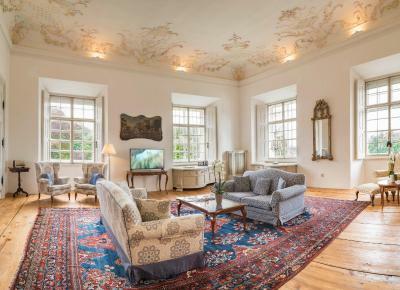 Offering views of the Leopoldskroner Weiher Lake and the Untersberg Mountain, this large suite in the historic palace was the former home of Max Reinhardt, the founder of the Salzburg Festival, who owned the palace from 1918 to 1937. 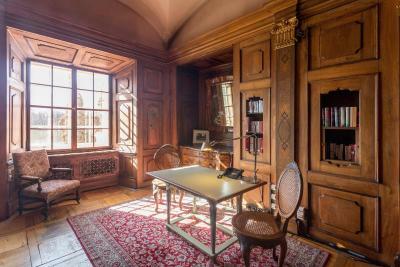 It includes a secret hall leading directly to his famous library. The suite underwent a soft renovation in 2016 and features newly upholstered furniture and classic memorabilia from Max Reinhardt's era. 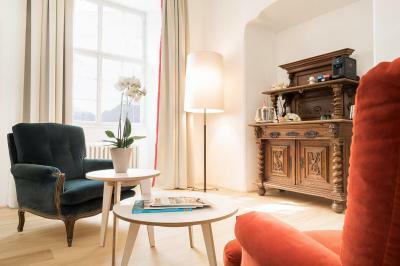 It features a flat-screen TV, safe, magazines, refrigerator, ironing facilities, bathrobes and slippers, a bathroom with a shower, hairdryer and toiletries, and a separate toilet. 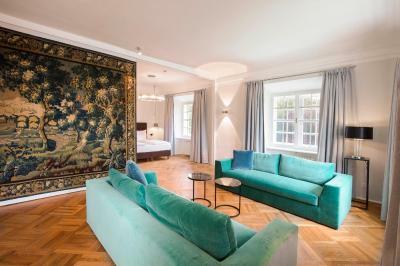 Renovated in 2014 and located in the Meierhof annex building, this spacious room overlooks the Leopoldskroner Weiher Lake, the Unterberg Mountains or Leopoldskron Castle. 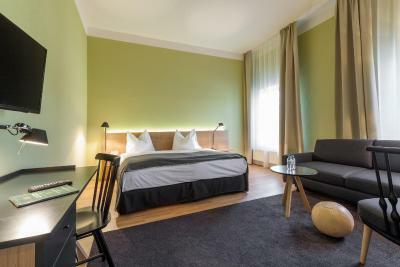 The rate includes a bottle of mineral water, WiFi, bike rental, a welcome drink, an admission to the adjacent pool, a rich breakfast buffet in the castle, a fitness center and parking. 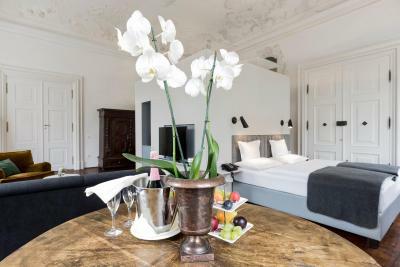 House Rules Hotel Schloss Leopoldskron takes special requests – add in the next step! 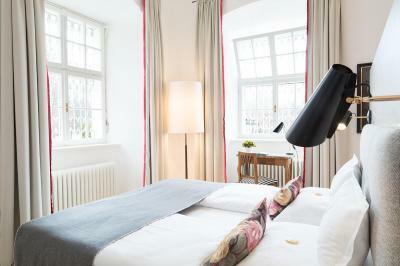 Hotel Schloss Leopoldskron accepts these cards and reserves the right to temporarily hold an amount prior to arrival. Please note that there is no on site restaurant, but several restaurants are within walking distance. 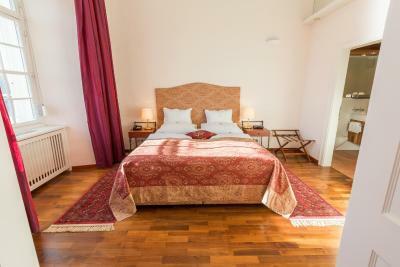 Please note that the extra bed rates may vary according to the room type. No tea and coffee facilities in bedroom. 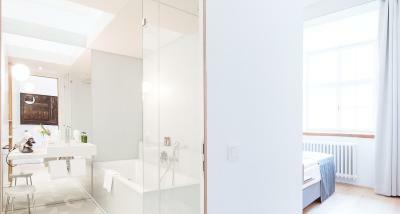 Lack of individual shampoo/shower gel or toiletries in bedroom. Small bar/cafe area by reception did not have enough food options to caterer for lunch/snacks. Beautiful Schloss and gardens. 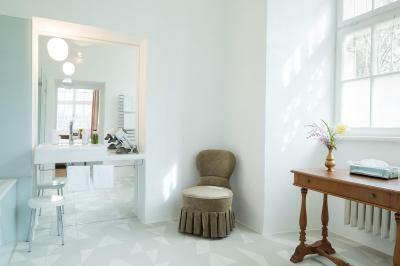 Clean,comfortable rooms. Fantastic views and area. 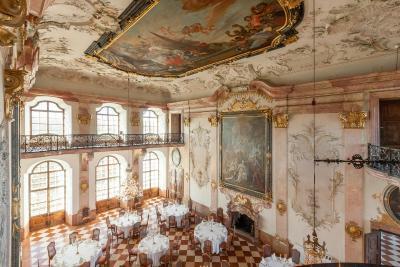 Wonderful buffet breakfast in a beautiful room in the adjoining old Schloss building. Beautiful scenery, fantastic building and great location. Absolutely ridiculous policy that there is no tea and coffee facility In standard rooms...it would have been a more relaxing stay if this was not the case. If the hotel worries about lack of footfall in their coffee bar as a result they should not...if someone wants an espresso based coffee they will still come to the coffee bar and purchase one! Location was the best in Salzburg...though a little out of the centre the views of the Untersberg mountains were breathtaking. I went to this hotel because I am a Sound of Music fan. The breakfast was wonderful and the room setting exceptional. Breakfast on the terrace overlooking the mountains and lake made me feel humble. Staff very professional and friendly. The room was adequate-I truly believe it was a bit overpriced, I believe we paid $267 US dollars per night for a small room in a side building on the property. Although the hotel looks perfect, it fails on the little details. It should pay more attention to the details in the garden and flowers, take better care of the facade of the Schloss. The sink in our bathroom was getting full when we turned on. They need to focus on the maintenance a bit more. 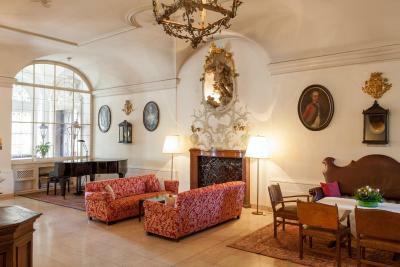 If you are a fan of The Sound of Music there is no better place to stay. We stayed in the Schloss and it was a dream, we did not want to go back home. The salon where the breakfast takes place is a dream. All the facilities are very pretty and its almost like staying at a museum. The tranquility and peace of this location make it worth the price. The breakfast was also amazing, with everything you could want. The main house and grounds are beautiful to walk through, and the library is not to be missed. Plan some time to just sit in there and peruse the shelves if you love books and cozy settings. The accommodations in the annex building were not incredibly fancy, but the bed was comfy and room size was ample. For me, sitting by the lake at dawn listening to the geese and birds sing while watching the rising sun cast a pink glow on the snow capped mountain in the distance was worth every penny. An electric kettle in the room would have been nice. Otherwise no negative aspects to report. Beautiful location, excellent facility. Breakfast was over the top and it will be hard to ever surpass it. Staff were wonderful and extremely helpful. Only wish our stay had been longer. Short walk to the historic area of Salzburg. You do have to climb every mountain to get to the town centre ;) could have done with another pillow. You are staying in a side building if you've just booked a room, only suites are in the pretty building, which wasn't too clear during booking. 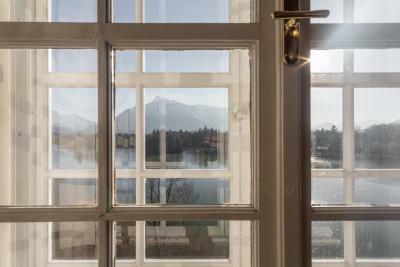 Superb location on the lake, with spectacular mountain backdrop, yet really close to Salzburg centre. 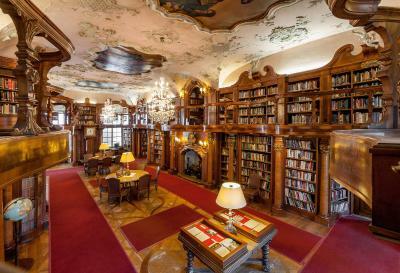 You can wander around the rooms of the Schloss quite freely and the library is stunning. Staff were exceptionally friendly and courteous. The pillows were super soft BUT we didn't inquire about changing pillows during our stay. They were in the process of restoring the inner court yard. That happened to be the view from our room so that was a little disappointing. The construction work also made it difficult to find the fitness center initially. Pillows were the only (minor) disappointment. Suggest you add a few pillows to each room. Everything exceeded our expectations (though there is no sauna etc, just a gym - not that that bothered us, but would of just ticked every box 100% then. The experience we had was second to none in all regards! Eating breakfast in the palace, whilst looking across the lake at the Alps is breath taking! Also, only a 25 minute walk into Salzburg proper! We will be back!!!! Staying in a real castle was a wonderful experience. Beautiful museum like place with lake and park in front. Great breakfast in castle. The view of the garden is very beautiful. And we can enter the palace for free. The palace is really magnificent and the place is used for the sound of music movie. 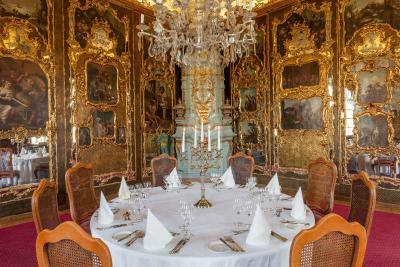 Breakfast was served in the hall of the palace which is really a wonderful experience.